Working as a freelancer can at times become very isolated and downright depressing. Even though I enjoy working on pattern design with Adobe Illustrator and it is almost my favorite work to do. I have to be very proactive to not fall into a downward spiral and have created systems to keep me in an upbeat mood and to continue my onward movement following an upward spiral. During the past years, I've decided to keep a little notebook where I write down little miracles 🔮that happen. Depending on your belief system, you might refer to them as God (Higher Power/ Goddess) -shots, invisible hands, the creative muse appearing, or sheer coincidences. I am going to start sharing them and hope to hear about your little miracles as well. Here are a couple of examples of how the peacock showed up during the duration of this project. Example No 1: I live in Pasadena, and my dentist is located in Arcadia. So on the day of my dentist appointment, a real-life peacock just sat right next to my parked car. Kind enough to wait and pose for me to take a picture. Example No 2: That made me remember and realize that the peacock is the official symbol for the city of Arcadia. So I stopped and took a picture of the city symbol too. It gave me such a happy feeling that the real life bird was patient enough to let me come close enough to take detailed photos. My cell phone's camera was good enough and I really think this creature quite enjoyed giving me a show. This entry was posted in Adobe Illustrator tips and tricks, Blog post with download, Colorful inspiration, Textile design on September 14, 2018 by Ludmila. Remember the year that Radiant Orchid was the color of the year? Well it inspired a textile design process from hand sketch to digital results. See photos of the entire process below. SCROLL NOW! Hello and thank you for visiting, you landed on our blog hop. For those of you that do not know what a blog hop is, its a collaboration of bloggers (and designers in our case) that blog about the same topic and create a loop that you can follow. This blog hop is a group of 40 international designers and spread out over 4 days. You can follow along on our design and thought process journey and see how the same color and inspiration will result in many completely different designs. Update as of July 2018 the loop is not longer functioning all the way around. BUT MARY TANANA has a list with all the blog links. This entry was posted in Colorful inspiration, Textile design, What do I need? Photoshop or Illustrator and tagged animal print, Bloghop, color of the year 2014, exotic, flora, floral, flower, jungle, pantone, radiant orchid, surface pattern design, tropical on January 18, 2014 by Ludmilaadams. Updated this post on 8/8/2018 - New course information and Free Summary PDF Download/ Majo's class has been removed by her for now. But it's still a great read. When I first wrote this blog post, I didn't have a public surface design course on my site nor did I have the resource vault filled with some of the resources mentioned on my blog. Enjoy! Scroll down for visuals of the Adobe Max pattern people class that I was looking forward to taking a couple of weeks ago (or rather years ago by now). Thank you to everyone who suggested which designs to submit, Unfortunately the class was structured a lot different from what I thought and I did not get to use them. More about that below. If you have never heard of Adobe Max check out this handy summary of resources I collected there and why it is called the creativity conference along with some new technology - nerdy findings that I mention. It's in the vault. Sign up and grab the key by clicking on the image. I am overdue for writing a blog post on this. SO stay tuned, the summary is a guide that could help you convince your boss to pay to go and learn there, but the blog post would share more about all the fun I have at Adobe Max. I always feel that even though I have been teaching Adobe Illustrator & Adobe Photoshop for years, it's important to occasionally peek into another's designer's workflow. There are so many tiny nuggets of valuable information that can be discovered when watching someone else being creative. I loved Majo's course image. It shows her style really well and one can see clearly the type of patterns that she taught during the course. In this photo Majo's shared how she uses her hand sketches to start her design process. As promised, here is a free video that you might want to watch. It's using the free templates that anyone can use from Madpattern.com. On to Adobe Max's session that I attended YEARS ago. Here are some pictures with description of the class in 2013. Some might recall that I submitted some of my doodles to them to see them being put into repeats. I imagined that we would see a lot of examples of our designs being put into repeats, but this class was a lot more, like a pattern history and background information on pattern people than a tutorial based class. These three pics are the three very clean designs that were made into a repeat. 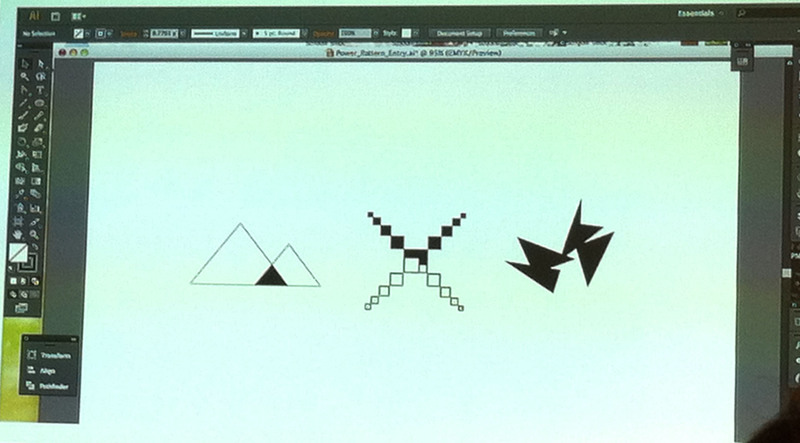 These are the 3 designs/ doodle from 3 different class participants that were being used. This is the final "mash up" of the designs. And look at it in color! 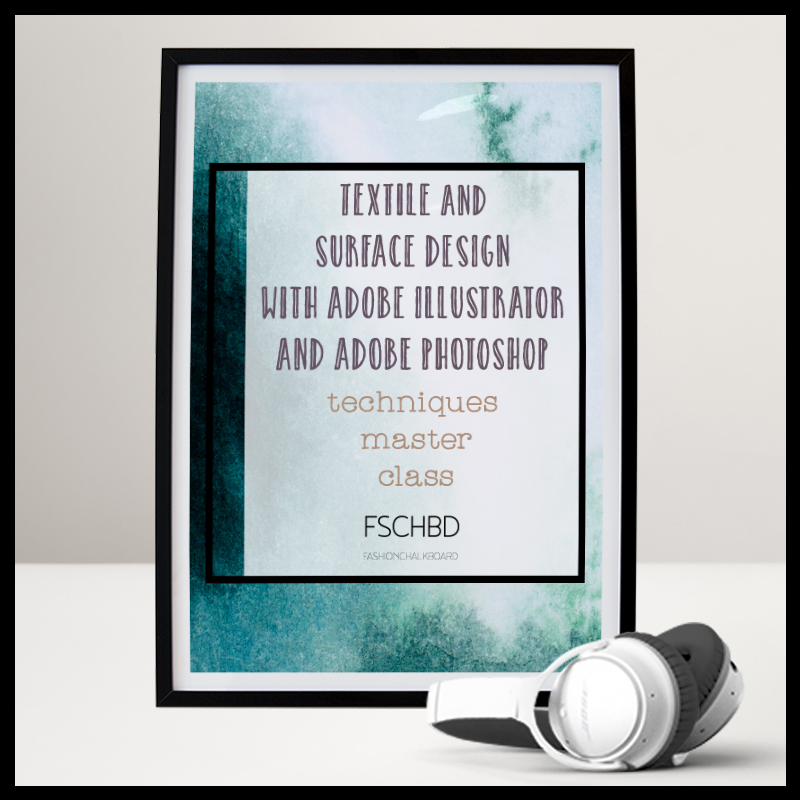 If you would like to stretch creatively in regards to creating textile - pattern - surface design art, also take a look at the online course that I created right here. The intro is a sample of one of the modules inside. Did you enjoy the video and images? Then let me know what you think in the comments below? This entry was posted in Textile design on May 27, 2013 by Ludmilaadams. Updated This Post On 8/8/2018 - Click here to see the visuals of the actual workshop that I attended and grab some goodies. It's that time of the year again. I am going to Adobe Max next week ( that was in 2013). One of the courses that I am really looking forward to is called: " the power of pattern: how to create & communicate through patterns". The creators of patternpeople, which is a very inspiring and informative website, are offering this course. They asked us to send them 2 (maybe 3) black and white "seeds". They are then going to show us how to make patterns with them. Here is what their email to us said: " We're looking for simple doodles - from geometric shapes to squiggly lines" below you can see art that I am considering to use? Which 2 should I submit? This entry was posted in Colorful inspiration, Textile design on May 2, 2013 by Ludmilaadams. This entry was posted in Colorful inspiration, Illustrator for Fashion Design class tips and tricks, Textile design on April 16, 2013 by Ludmilaadams. This entry was posted in Colorful inspiration, Photoshop for Fashion Design class, Textile design on July 19, 2012 by Ludmilaadams. Today I am sharing this great quick lovely video by Los Angeles Fashion Designer Eva Franco who let’s us peak into her studio and follow along her design process. This entry was posted in Behind the scene Fashion Designers, Colorful inspiration, Photoshop for Fashion Design class, Textile design and tagged design process, fashion designer, Photoshop, textile design on February 22, 2012 by Ludmilaadams. My website currently only advertises and shows access to 6 courses, but all access members can access 2 more (8 full courses total). This entry was posted in Colorful inspiration, Illustrator for Fashion Design class tips and tricks, Photoshop for Fashion Design class, Separate colors for screen printing, Textile design and tagged create a book, printed textile fabrics, Separate colors for screen printing on January 17, 2012 by Ludmilaadams. Having worked at H&M as a teenager in Hamburg, Germany; this place obviously always has a special place in my Fashion Design heart. This entry was posted in Blog post with download, Colorful inspiration, Fashion Flat, Illustrator for Fashion Design class tips and tricks, Textile design on October 21, 2011 by Ludmilaadams. This entry was posted in Career advice, Colorful inspiration, Gadgets, Textile design on October 14, 2011 by Ludmilaadams. Resources and tips oh my! Where should I send your Password to unlock the vault? You will also get email updates on new items in the vault and tips.